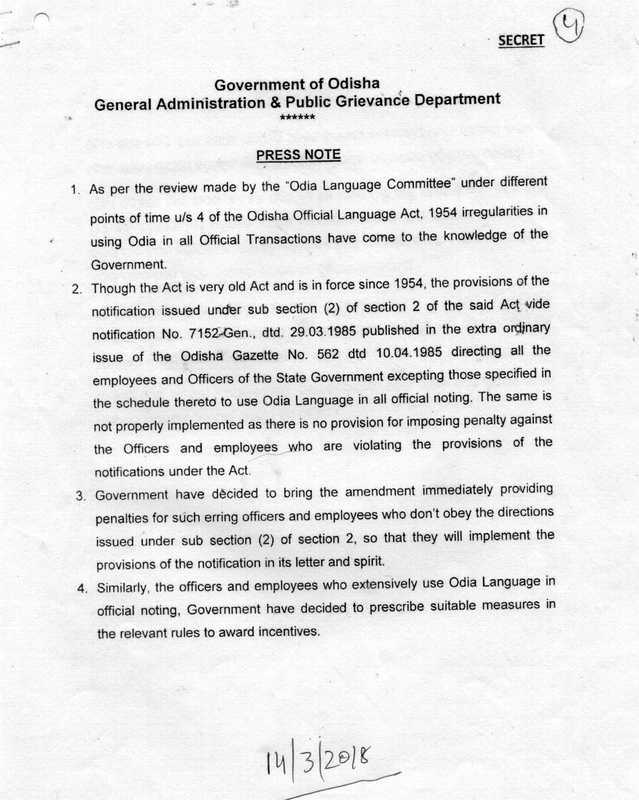 If the Legislative Assembly of Orissa has an iota of sense of privilege, it should charge Chief Minister Naveen Patnaik for having deliberately misled the House to insert Section 4-A into Odisha Official Language Act, 1954, which is designed to quash the very purpose of the same Act, by telling the Assembly a blatant lie that the amendment was because the State Cabinet has decided it to be so. But the Chief Minister has suppressed this vital fact from the Assembly with ulterior motive, as he is hand-in-glove with non-Oriya /anti-Oriya elements to kill the very purpose of the Orissa Official Language Act, 1954. The Statement of Object and Reasons of the Official Language (Amendment) Bill, 2018 moved in and passed by the Assembly on 1.5.2018 is the proof of this offense against the Assembly. I am giving below the photo. The modus operandi of the Chief Minister breathes malice. He authorized Parliamentary Affairs Minister Bikram Arukh to move the Bill for adoption on May 1, 2018, after designing that the Bill, if adopted, would destroy the very purpose for which the State of Orissa was created and the first Assembly, elected by the people of Orissa under the Constitution, had enacted the Orissa Official Language Act in 1954. His father Biju Patnaik had used the Assembly to impose English Language as an Official Language in matter of the Assembly businesses in 1963 that had inserted Section 3-A into the Act, but his desire to transform English as the Official Language in place of Oriya could not be fulfilled legally. Mr. Naveen Patnaik who is in power with the help of Biju sycophants and continues to name almost all the State-funded schemes and projects after Biju, is determined to fulfill his father’s incomplete conspiracy against the Oriya language by ruining the scope and applicability of the Act of 1954, which had made it clear that, in the entire State of Orissa, in all and any official work, Oriya shall be the language. Section 4-A destroys this stipulation. This illegality is shown to be legitimate by linking it to Cabinet Resolution dated 26.12.2017, which was, as its notoriety was exposed threadbare, superseded by the Resolution on 14.3.2018. But the Bill that was placed before and passed by the Assembly on 1.5.2018, had no trace of the fact that the cabinet had decided to amend the Act as per its latter resolution, i.e. resolution dated 14. 3. 2018. The ‘Statement of Object and Reasons’ of the amendment dated 1.5.2018, clearly noted that the same was “as per the decision of 51st meeting of the Cabinet held on 26.12.2017 at 11.15 AM”, which was atypical of all the other Bills placed before and passed by the Assembly the same day. On 1.5.2018, the number of Bills placed before and passed by the Assembly was five. These were, seriatim, (1) Odisha Official Language (Amendment) Bill, 2018, (2) Odisha Shops and Commercial Establishments (Amendment) Bill, 2018, (3) Odisha Legislative Assembly Speaker’s Salaries and Allowances (Amendment) Bill, 2018, (4) ) Odisha Legislative Assembly Deputy Speaker’s Salaries and Allowances (Amendment) Bill, 2018 and (5) Odisha Ministers’ Salaries and Allowances (Amendment) Bill, 2018. All these were as per Cabinet decision. But when the Cabinet decisions were never mentioned in any of these Bills, the date and time of the Cabinet decision was shown only in the Odisha Official Language (Amendment) Bill, 2018. This atypical ‘Statement of Object and Reasons’ of the Language Bill makes it unambiguously clear that the legislative intention in this particular case is to grant the functionaries full freedom to destroy the very purpose and spirit of the Official Language Act. The mala fide conduct of the Chief Minister is further discernible in tampering of the Resolution of 26.12.2017 too. 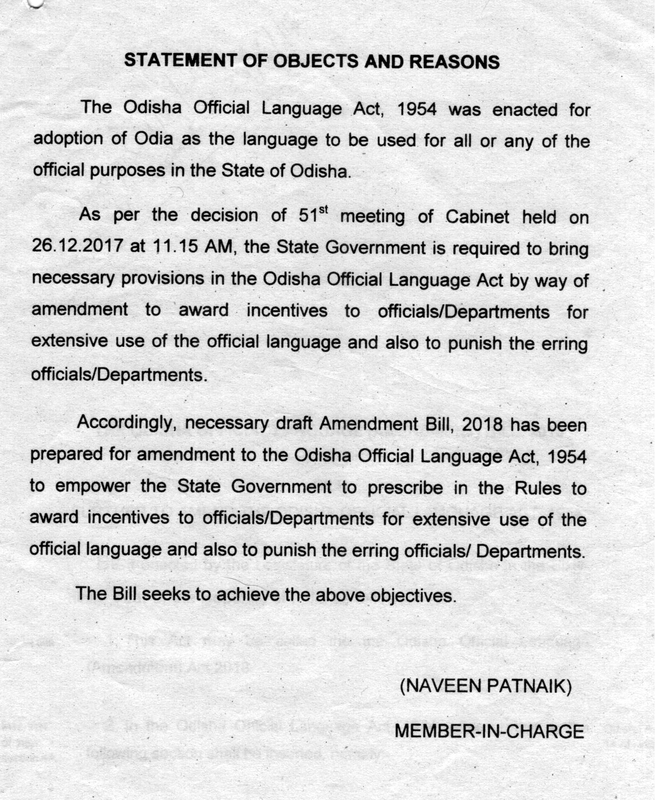 Even though the said resolution had asserted to punish the department as well as the officials for not using Oriya language in noting, the words ‘as well as’ were replaced with the word “or” in the Bill. Where from the Chief Minister got the carte blanche to change a Resolution adopted by the Cabinet behind back of the Cabinet? – I had asked. This had put the CM in serious predicament. Firstly, two of my closest colleagues in Bhasha Andolan – Pradyumna Satapathy and Pabitra Maharatha – were gained over through the Finance Minister and were used to stop the movement; and secondly, to hoodwink the general public, Odisha Official Language (Second Amendment) Bill, 2018 was brought in and passed on 19.9.2018. It further tampered with the Resolution dated 26.12.2017 and by being limited to amend Section 4-A, which inserted into the Act illegally by misleading the Assembly with false Statement on 1.5.2018, it repeated the same offence against the privilege of the House, as it had done at the time of the insertion of above section. The first amendment was a fraud perpetrated by the Chief Minister on the Cabinet, a trick, which the MLAs could not properly read due to paucity of time and unavailability of the said resolution for perusal and study. And, the 2nd amendment is continuation of the offence of misleading the Assembly by the Chief Minister. To be precise, the offence of misleading the House with suppression of vital facts and placement of false statement while bringing in the first amendment on 1.5.2018, has been repeated in the matter of the 2nd amendment on the last day of the last session. Is it not a challenge to the sense of privilege of the Assembly of Orissa? Is it not an insult to the Assembly? Let the Assembly determine. All the people of Odisha should know this…. How conspiracy has been made to destroy Odia. Let the other members of the state assembly know, realize the truth and act for the interest of the state and the people at large.